For some reason, 2011 seems to be the year during which concert photographers have made unfortunate headlines for being the victims artist stage rage. As we’ve shared before, concert photographers put themselves in some pretty dangerous and potentially violent situations so fans enjoy amazing photos from the show. Knowing how crazy a place the live music experience can be it’s really no surprise that this kind of stuff happens. But there really no excuse for the violence and breaking a photographer’s camera. I’ve never personally been the victim of artist stage rage, but I know that whenever I ask Colleen about her experiences she always says that being in the photo pit and shooting concert photography is a swirling mix of fun, exhilaration, fear and anxiety. And speaking of concert fan fears and emotions, I wonder if photographers who experience these kinds of events develop lasting fears or maybe even post-traumatic stress disorder that follows them to future shows? And considering our recent exploration of female emotions during a concert, I also wonder how Smeyne’s experience would be different from a male photographer. 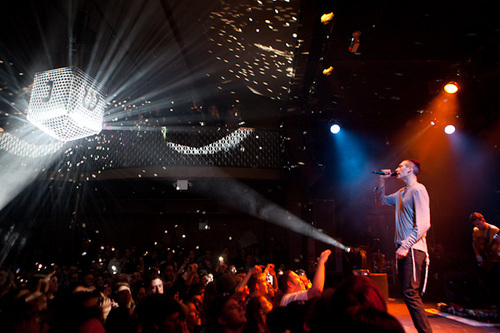 This Matisyahu story also reminds me of what I found at one of his concerts and my interview with him in 2010 when we talked about his thoughts and feelings during a live show. During that chat we talked about the “trance-like spiritual state of worship” he goes into during a show and I imagine disrupting that moment of intense worship might have lead to his violent response towards Smeyne. Sure, you might expect a more peaceful response from a guy like Matisyahu, but I don’t think it’s as simple as that, because stage anxiety and a whole host of other emotions are impacting and driving the performance. So any kind of intrusion to that moment of worship could be viewed as a threat, and instead of flight you get full on and raging fight. This whole topic of how artists rage on photographers during a show and the emotional implications thereof is one that we’ll continue to explore. And I hope we share more stories like these to better understand the emotional complexities of the situation. That said, I also hope all you photographers out there stay safe, enjoy the show and get those great shots. We know it’s not easy work and most of the time it ain’t glamorous to slave away in the pit just to get a handful of shots. And most of you, I know, aren’t doing it for the money — it’s truly a labor of love. If you were at this show or have experience a similar situation, let us know in the comments below and we’ll share your story on a future episode of Live Fix Radio.